I first met Phil Terrie many years ago, when he invited me to his cabin on Long Lake, partway down from Long Lake village toward the outlet. At the time, he was acting as a consultant for a Mountain Lake PBS documentary on Adirondack history, so producers, cameramen, and so on were hovering around. In the midst of all that, word came that a hiker was missing. Rangers and volunteers appeared, and he began helping them get the lay of the land to the southeast in the vicinity of Kempshall Mountain and to northeast up the Cold River valley into the Sewards. “This is pretty impressive,” I thought. “Here’s a guy who can simultaneously advise a film crew on arcane aspects of Adirondack history and help orient searchers heading into some of the most rugged wilderness in the Park.” This, I reflected, was not surprising for someone who has both “Ph.D.” and “Forty-Sixer” after his name. On that day, Terrie was demonstrating the breadth of his knowledge of both the intellectual and physical landscapes of the Adirondacks. That breadth quickly surfaces in Seeing the Forest, a new volume that compiles fifty-eight of the nearly seventy essays, articles, profiles, op-eds, reviews, and other pieces he has published over the two-decade life of the Adirondack Explorer, which he describes in the acknowledgments as “the journal of record on all matters Adirondack”—an apt description, given that perhaps more than anyone else he has helped make it so. The title, truncated from the popular expression about not seeing the forest for the trees, is also apt, for Terrie does in fact see the forest, the big picture, as the essays in this collection attest. An immediate clue to the variety of coverage is the table of contents, where we see that Terrie’s writings are grouped into four categories: People and Places, Arts and Letters, Environment and Policy, and Musings and Opinions. The selections are given new titles, which makes sense when the original appeared as a book review, of which there are many, but doesn’t always seem necessary otherwise. They’re generally only three or four pages long and can be read in any order. This is a good bedside book that you can open to any page and be entertained and enlightened. Within each section, the breadth is reinforced. For example, in People and Places, the mix of personalities spans three centuries, including the 1890s camp diarist Arpad Gerster, inveterate mountain climber Orra Phelps, and preservationist Clarence Petty. Sites featured range from the relatively large (Lake Champlain) to the more intimate (Great Camp Santanoni). 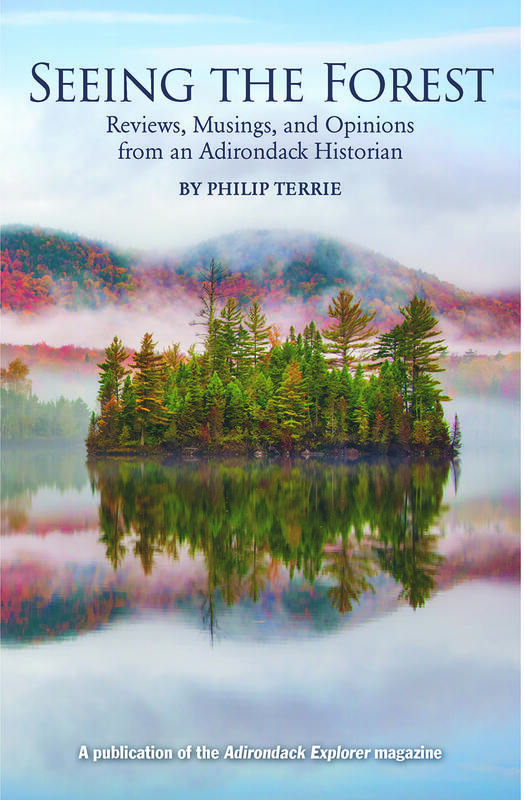 One chapter, “Everything Adirondack,” a 2004 review of Jerry Jenkins’s remarkable book The Adirondack Atlas, could be a subtitle for Terrie’s anthology, if it didn’t already have a perfectly good one. Originally from “the Mountain State” of West Virginia, where an affinity for bumpy ground likely first implanted itself, Terrie has spent his adult life as an academic. Armed with an undergraduate degree from Princeton University and a doctorate in the interdisciplinary field of American studies from George Washington University, he spent much of his career teaching English, American culture, and environmental studies at Bowling Green State University in the astonishingly flat, corn-carpeted northwest quadrant of Ohio. 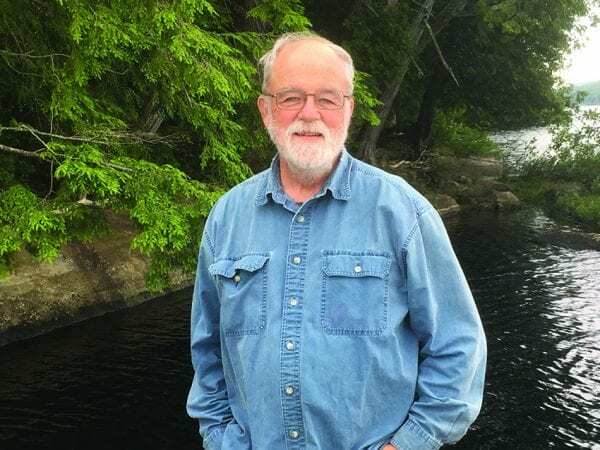 Closer to where his heart has always been, he also served as a researcher and assistant curator at the Adirondack Experience, back in the quaint old days when it still called itself a museum. But he doesn’t write like a stuffy professor or cloistered collections archivist. There are no elbow patches on his style. Far from it. His writing is uniformly accessible, clear, and concise. “The New York State Constitution is a mess” is the first sentence of one article that appeared in the Explorer last year. Can we get any more concise than that? Professor Terrie writes for the layperson, not just his fellow scholars. Read him, and you will actually understand the difference between the Forest Preserve and the Park, or how state constitutional conventions affect the Adirondacks, or why Emerson’s summer sojourn on Follansbee (now Follensby) Pond back in 1858 was important in American thought. Navigating the Adirondacks can be daunting, whether we’re talking about history or current politics or ecology or how to get to a certain Round Pond. Phil Terrie is the rare individual who can help with all those forms of bushwhacking, as this assemblage of his writings proves.